Short Sale. Property requires updating, repairs and has a substantial amount of deferred maintenance. 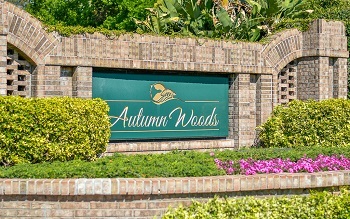 Do you have dreams of a grand home surrounded by soaring trees in a park like setting visit Autumn Woods of Palm Harbor, Florida? Just take Alderman west from US Hwy 19 N. to the entrance of Autumn Woods. This impressive community features homes for sale starting at reasonable up to luxury prices depending on size and amenities. Built in the 1980's, these opulent homes can vary in size from a 2500 sq. ft. family style home to a 8500 sq. ft. mansion estate. They have beautiful custom architecture and curb appeal set on large landscaped lots making the entire neighborhood a scenic adventure to drive through. Many residences have three car garages, gourmet kitchens, wood burning fireplaces, and vaulted ceilings. They are all surrounded by gorgeous trees, oversized lots and lush landscaping giving this community a rural country feel, yet so close to city life. It's like nothing you could imagine in Palm Harbor. You truly have to see these homes for yourself! Selling your home in Autumn Woods? If you are planning to sell your home in Autumn Woods, it would be our pleasure to share with you our marketing plan. Call us at your earlist convenience and we'll set up an interview with our experienced agents or you can fill out your information in the form we have provided for you down below! We are looking forward to hearing from you and getting you the best possible sale of your home.